Discovering Orthodox Christianity, a 26-part series of talk shows and Bible Studies produced by Greek Orthodox Telecommunications (GOTelecom) and designed to educate viewers about the basic teachings of Orthodoxy, was made possible with a $270,000 grant from Leadership 100 Endowment Fund. Five of the programs are presented by Archbishop Demetrios and were videotaped at the Greek Orthodox Archdiocese headquarters in Manhattan while the remaining twenty-one were videotaped with a variety of presenters at Holy Cross Chapel, on the grounds of Hellenic College Holy Cross Greek Orthodox School of Theology. All of the programs were developed by GOTelecom Senior Producer/Director Nicholas J. Furris and Managing Director of GOTelecom, Marissa P. Costidis, with input from Stavroula Savelidis. The production team worked closely with the Director of the Department of Religious Education, Dr. Anton Vrame, to identify show topics and experts in those fields. Staci Spanos, newscaster from Jacksonville, Florida, served as the host, engaging the guests and inspiring thoughtful and educational discussions. “We are extremely grateful to His Eminence Archbishop Demetrios and Leadership 100 for recognizing the opportunity to use video and subsequent dissemination in multiple platforms to educate and inform our faithful and all people who are interested in the Orthodox Faith. Leadership 100 has always supported the work of GOTelecom, and in this day and age we have so many more ways of getting our message of Christ’s love out to an international audience,” said Nicholas Furris. 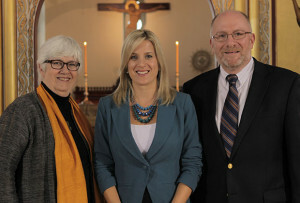 The programs were rolled out to the public beginning of November and are accessible on YouTube at YouTube.com/greekorthodoxchurch, as well as highlighted on the Greek Orthodox Archdiocese, GOTelecomTV, television through WhereverTV, the only Greek Orthodox channel offered. The Channel is free on both Internet and television and features past GOTelecom productions, including Greek Orthodox religious, cultural and educational programs. WhereverTV, a cable television service, uses the Internet instead of cable wires or satellite dishes to deliver television. To learn more about its GreekTV service, an interested viewer can visit: http://greek.wherever.tv or call WhereverTV at 412-663-0094. The programs are also available as a complete set for parish and ministry education and can be obtained by contacting GOTelecom at 212-774-0244.